It’s a hot, sunny day in August, and high school students Mckayla Dixon, Anesa Reed, and Keith Jamison are working their summer jobs. 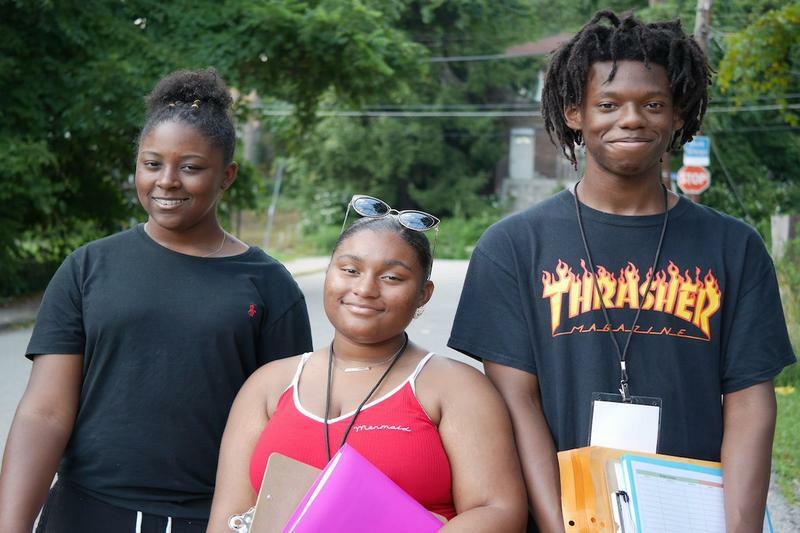 The three teenagers are pounding the pavement, walking up and down hills, with clipboards in hand, hoping to talk with residents in Pittsburgh’s Lincoln-Lemington neighborhood about their exposure to lead. The teens are part of a group of 20 students who have chosen this lead education and community outreach track from other summer jobs available through YES, Youth Enrichment Services. They are receiving a salary through the Learn and Earn program. Some are mapping housing stock, determining which sections of the neighborhood are most likely to have older homes with lead paint. Others are investigating where people in the community get their information. The group even traveled together to Flint, Michigan to learn about the disproportionate impact that lead is having in communities of color. Denise Jones is program director for YES. She’s shepherding this group of three students around Lincoln-Lemington, knocking on doors right along with them. Jones says they chose Lincoln-Lemington because there’s a lot of older housing stock here, built before 1978. And, she says, the neighborhood gets less attention than others in Pittsburgh’s East End. “This community is a little unnoticed because a lot of the residents have been here for years. There isn’t this influx of demographic change,” she says. Denise Jones, program director at Youth Enrichment Services, says she wants students to feel empowered to create change from within their own community. Lincoln-Lemington is a mostly African-American community, and many of the students in the YES program live there or close by. “I’m not gonna lie. I knew about some of the dangers of lead, but not really in depth,” Anesa Reed says. She lives in nearby Highland Park, and says it was cool going home and telling her mom everything she was learning about lead. She has a little sister at home, and learned kids under six are most at risk to lead exposure, and its consequences, like developmental delays and behavior problems. Marcus Poindexter is a doctoral student at the University of Pittsburgh, and this summer he’s the research coordinator for this project of Youth Enrichment Services. Plus, Poindexter says, people are just more likely to talk to kids. He’s been helping them craft a survey to find out more about lead exposure in Lincoln-Lemington, and practicing a sort of script for how to approach residents. If people don’t have time to talk, Poindexter and the students came up with a plan to hand out pamphlets about lead in paint and household dust, provided by the Allegheny County Health Department. Officials there met with the teenagers early on in the project, and helped hone the survey questions. Lincoln-Lemington resident Sikina Harris, and her little dog Queen, happened to be home when Dixon, Jamison and Reed came to her front door, and she was willing to take the survey. She doesn’t have any children under six years old living with her, but she does have an older daughter. Denise Jones says YES wants these students to understand that they have the capacity to create change from within their own community, and also to see research as a potential career. She says students will evaluate the completed surveys, and turn them over to the Allegheny County Health Department. Dave Namey, program chief of the health department’s Housing and Community Environment Program. “I think what we’re going to get out of it is we’re going to be able to understand a little better what people know in the neighborhood about lead, and develop strategies to further mitigate risks for children,” he says. Namey says the health department is looking to identify other neighborhoods in the county where community leaders, and maybe even more young people, could help get the word out about the dangers of lead.